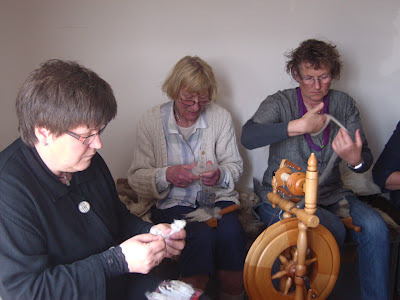 A group of girls from Norway visited for a week for a spinning workshop. We have a direct flight from Bergen through the summer. The girls came in on the first of these flights which coincided with Norwegian Independance Day on the 18th of May. So before we started spinning we had a great day out at Scalloway for the celebrations there. There are always some celebrations for the 18th of May here in Shetland because of the connections we have. This year was the opening of the new museum in Scalloway by Norway's Prime Minister, so there were extra events on. We were not always so serious. We had great fun as well. 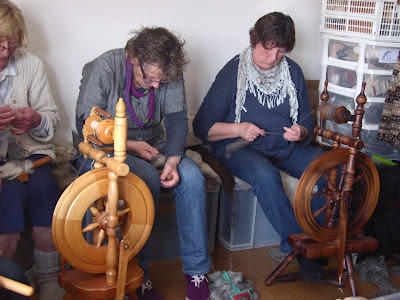 We covered different fleece preparations with different qualities of fleece. Then spinning on different wheels to produce yarns for a variety of purposes. 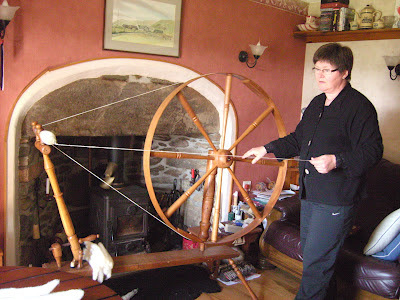 We ended with a try on the great wheel which is wonderful to spin on - such a smooth and satisfying process. All too soon the week was over and the girls went home. The house and studio was much quieter again. And I had to get back to spinning myself.